Hydrogen is the most abundant element in the cosmos. It’s also the simplest, with only a single electron in each atom, and forms a transparent gas under ordinary conditions. But that simplicity is deceptive, for example, at the extreme pressures and temperatures found inside of giant planets. New work published in Physical Review Letters shows that hydrogen transforms to a dark fluid at these conditions on the way to becoming a conducting fluid. The new experiments were conducted by Stewart McWilliams (now at the Univesity of Edinburgh), as well as former CDAC postdoctoral associate Alan Dalton (now at the Defense Threat Reduction Agency), Alexander Goncharov (Carnegie), and Mohammad Mahmood (Howard University). CDAC has provided instrumentation and laboratory support for these and related experiments over the past decade. The group identified a form of fluid hydrogen that does not reflect or transmit visible light, but does transmit infrared radiation, and therefore heat. 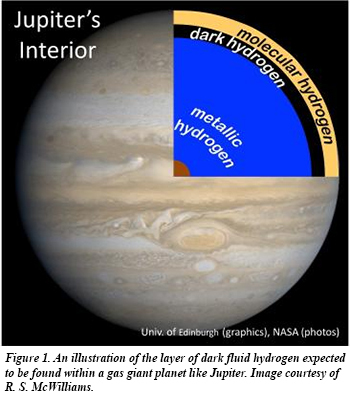 This observation helps to explain how heat can escape from gas giant planets, and how fully conducting fluid hydrogen deeper inside these bodies produces their large magnetic fields. The work is consistent with dynamic compression experiments, including recent CDAC-supported studies carried out at the National Ignition Facility at Lawrence Livermore National Laboratory [R. S. McWilliams et al., Phys. Rev. Lett. 116, 255501 (2016)].